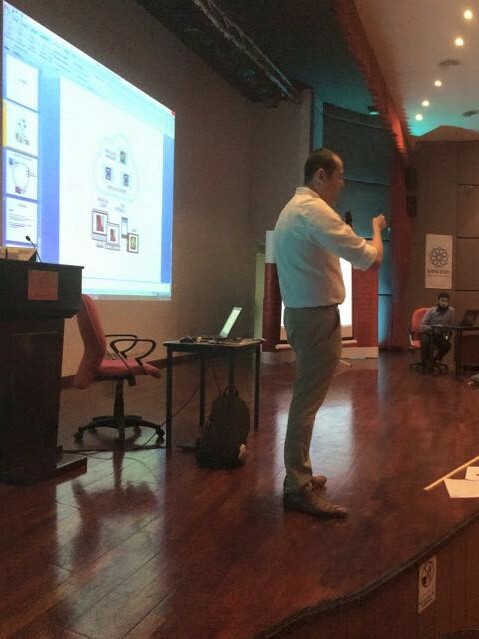 Two days ago, I was part of a BIMcloud event held at the Canadian University of Dubai. BIMcloud was launched by Graphisoft just over a year back in Japan. Why Japan and not in the US, Europe or even down under? Lachmi Khemlani explains in this blog post from April last year. The process began a few weeks back when Djordje Grujic contacted a bunch of us on email and asked us if we would be willing to take part in this event. I think every single one of us jumped at the opportunity and, for me, it was not simply a learning experience but a very enjoyable one as well. I was being given a chance to, literally, plug into a small part of the global ArchiCAD community and interact with them in real-time. Initially, all our discussion was carried out via email but as the date got nearer, we moved over to Skype. This proved useful in the end because Teamwork messaging was iffy an my end at least -- any message I sent from within ArchiCAD took about twenty minutes or more to reach the intended recipients although I could receive messages instantaneously. Gábor Kovács-Palkó and Márton Kiss over at Graphisoft were discussing something about a local proxy so I cursed my internet service provider (wrongly, as it turned out) and we used only Skype to communicate during the event. 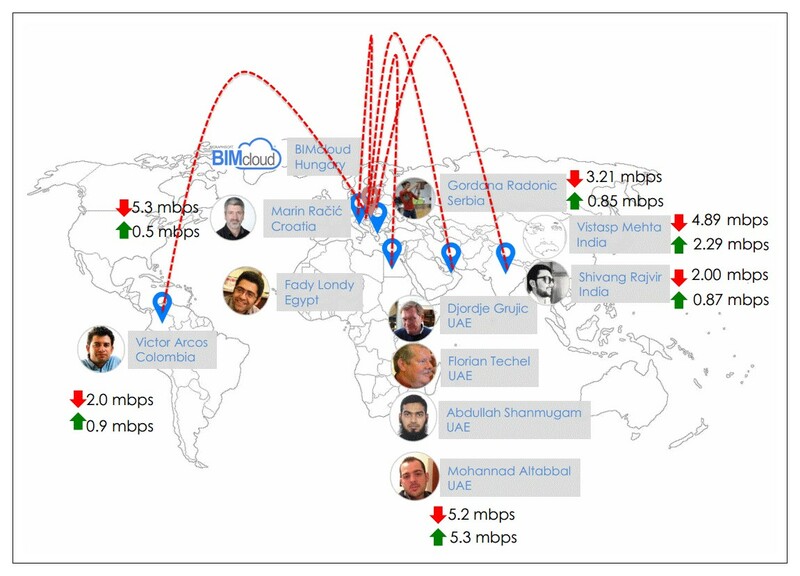 Graphisoft was hosting the file on their BIMcloud server in Hungary so, essentially, the data sent from my computer was bouncing across the internet from Mumbai to Budapest to Dubai - a total distance of about 10,000km. It was similar for Shivang Rajvir in Ahmedabad. In comparison Victor Arcos in Bogotá, Columbia, was sending his data around 14,000km. Marin Račić and Gordana Radonic in Croatia and Serbia respectively had relatively shorter hops for the first leg but must still have been closing in on 5,000km each. The guys in Dubai and Egypt (we didn't interact with the latter) must have been clocking about 8000km with the data going to Budapest and back. These are straight-line distances of course. If you try to calculate the undersea cable routing and the satellites out in space, the distances would be many orders of magnitude greater. The file we were working on was large. My project files never cross 100MB so this one, which weighed in at a whopping 1.2GB was many times larger. Shivang couldn't load it on the first PC he tried but, on the second one with twice as much memory, it did open. On my own system, I found that I was consuming about 65% of available RAM. Of course, there were a bunch of other programs running at the same time. Before we began the exercise, we downloaded and installed the BIMcloud Proxy to our machines. What this does, essentially, is cache the project data so that after the initial download, subsequent data transferred over the net is limited only to the changes being made. At first, I thought this would only be needed in an office where multiple computers were accessing the same project but I learned that it was necessary even for my single machine. A couple of days before the event we had a discussion so that we all knew what was expected of us and there was a dry run as well. As a solo practitioner who has never even used Teamwork before--never mind BIMcloud--it went surprisingly smoothly and the process was intuitive. Yes, the teamwork palette does take up screen space if you keep it open but that's what my second monitor is for! On Tuesday, we gathered online before the event and first Abdullah Shanmugam and then Djordje walked us through it, giving us Skype updates on what was happening at the venue even as he did his part of the project and found time to post the photos he was taking, to Facebook. That, girls and boys, is known as multi-tasking. There were about fifty people in the auditorium but given its massive size, it looked somewhat sparsely populated. When the event was done--or at least when our part was done--we disbanded; and heard the next day that it had gone on for three hours in all. But it wasn't all over for me. The guys over at Graphisoft spent yesterday figuring out why the messaging was so tardy from my computer (they'd asked for certain log files). This afternoon, I had a Skype session with Márton where he asked me to first, change a registry value, then revert back to default value and finally he asked me to replace a dll file on in my program folder with one that he sent. Messages were sent each time and, finally, it worked! What had been so utterly unreliable earlier was suddenly purring along like a Rolls Royce. I am told, this new dll will be part of the next program hotfix. No software is ever completely free of bugs but it's the commitment of the developers in squashing those bugs which makes all the difference. For my part, I'm extremely pleased to have played a small role in it. Oh, and I've made a few new friends along the way. Thanks, each and every one of you.